James Grant & Jody Wisternoff - Anjunadeep 10. CD. Anjuna Music Store. Anjunadeep, the renowned UK label known for breaking acts like Dusky, Lane 8, Yotto, Cubicolor and Eli & Fur, presents the tenth instalment of their chart-topping annual compilation series. With label co-founder and A&R James Grant and globe-trotting Bristolian DJ Jody Wisternoff at the helm, the pair now mix their sixth compilation together - ‘Anjunadeep 10 Mixed by James Grant & Jody Wisternoff’. The label carries this momentum into 2019, with Grant and Wisternoff presenting the carefully crafted ‘Anjunadeep 10’. An eclectic mix of exclusive electronic cuts ranging from the dreamlike melodies of Tokyo’s Lycoriscoris and Stockholm’s boerd, to peak-time dancefloor gems from Yotto, Lane 8 and Luttrell, ‘Anjunadeep 10’ captures the full range of the label sound. Alongside an abundance of edits and remixes from James & Jody themselves, the compilation welcomes a hand-picked selection of new names and emerging talent to the label. This year’s installation sees label debuts from the likes of BAILE, Ocula and GRAZZE, as well as familiar names Virtual Self and Tomas Barfod, via a pair of exclusive remixes from Lane 8 and James & Jody. 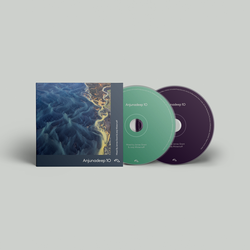 ‘Anjunadeep 10’ will be available to pre-order on 16th January via Anjunadeep, digitally, on CD and as a part of a limited edition signed poster & CD bundle.